The Hannya (般若) mask is a mask used in Noh theater, representing a jealous female demon. It possesses two sharp bull-like horns, metallic eyes, and a leering mouth. The name hannya (般若) is a Sino-Japanese word for prajna or wisdom. One tradition states that this name was given to this mask because it was the name of an artist monk Hannya-bō (般若坊) who is said to have perfected its creation. Another explanation is that Perfection of Wisdom sutras and their variations were considered to be particularly effective against female demons. An alternate explanation is that the artist would need a great deal of wisdom in order to create this mask. The Hannya mask is used in many noh and kyōgen Japanese plays, as well as in Shinto ritual kagura dances. The Hannya mask portrays the souls of women who have become demons due to obsession or jealousy. Plays in which a person may wear the hannya mask include Aoi no Ue and Dōjōji; its use in these two plays, two of the most famous of the Noh repertoire, and its distinctive and frightening appearance make it one of the most recognizable Noh masks. The Hannya mask is said to be demonic and dangerous but also sorrowful and tormented, displaying the complexity of human emotions. When the actor looks straight ahead, the mask appears frightening and angry; when tilted slightly down, the face of the demon appears to be sorrowful, as though crying. The oldest hannya mask is dated 1558. Aoi no Ue - worn by the Lady Rokujō in her second-half appearance as a demon. Dōjōji - can be worn by the dancing woman in her second-half appearance as a snake, though the Shinja (真蛇) mask is also used. Kurozuka (known in the Kanze school as Adachigahara) - worn by the spinning woman of Adachigahara after she is revealed to be a demon. Momijigari - can be worn by the noblewoman after she is revealed to be a demon. Jump up^ "hannya". Japanese Architecture and Art Net Users System JAANUS. 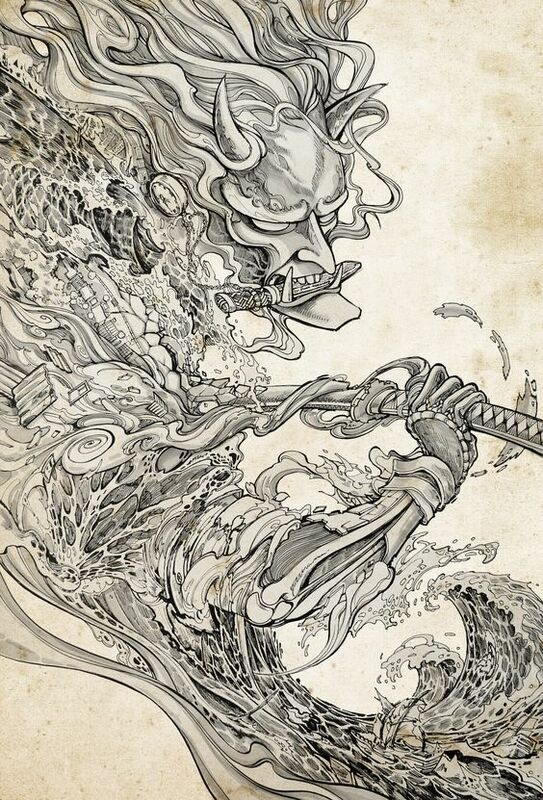 Jump up^ "Onryô - Hannya". the-noh.com. Jump up^ Sadler, A.W. "'O-Kagura'. Field Notes on the Festival Drama in Modern Tokyo". Asian Folklore Studies. Nanzan Institute for Religion and Culture. 29: 294. JSTOR 1177614. Jump up^ Coldiron, Margaret (2005). "Lions, Witches, and Happy Old Men: Some Parallels between Balinese and Japanese Ritual Masks". Asian Theatre Journal. 22 (2). JSTOR 4137132. Jump up^ Bethe, Monica; Emmert, Richard (1997). Aoi no Ue, Noh Performance Guide 7. Tokyo: National Noh Theatre.